As Microsoft has enrolled the new Windows 8 Metro Style OS, a lot of change in the designing section of the blogging community has been seen. Now a days people are changing their template/theme and giving them a Metro look. If you are one of those people here is a fabulous widget for you - A Metro Style Blogger Search Bar. Its CSS has been compressed to make it load faster. The bar looks very cool and I personally like it. Well there is no need to demo for this search bar, you can see how this search bar looks in the above image. So you can add this widget to your blog with our 1 Click Installation button or by adding the code manually. Now save the widget and save the template. If you want to increase/decrease the text box width change 160px with your desired width. You are done now. 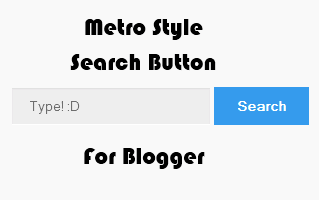 Now you and your visitors can see this awesome Metro style Search bar in your blog. But blogger is providing default search bar na?does this widget works same as google's custom search? No its different from the default google custom search. According to Google Adsense Custom Search Engine Policy, webpage consisting search results should have width of 800 PX but my blogspot blog's sidebar is trouble in the way. Is there any way to remove the sidebar of blogger blog to make the width of post area larger. hey , I wanted to install CSS hover effect to the search button . anyway ? Nice share!!!! after a minute of search, this one works! Thanks!